As the landscape of the hotel industry changes, your hotel advertising strategies need to change with it. The right hotel ads strategy can make the difference between a successful and less efficient campaign. Your hotel ads strategy needs to target the right people, at times when they’re looking for a hotel like yours, and offering what they want at the best possible price. What is a Hotel Advertisement? Hotel ads can take many forms. Traditional hotel ads might include ads in print media, television advertising, billboards and so on. These can be effective for many demographics but are no longer sufficient to reach everyone in your target audience. In the modern world, digital advertising in all its many forms is increasingly significant. Why are Hotel Ads Important? Simply hoping that your customers will come to you is not a winning strategy in today’s world. It’s not enough simply to let people know your hotel exists — they have to know why it’s right for them. To compete successfully, you need not only to have hotel ads but a carefully targeted strategy for your hotel advertisements. 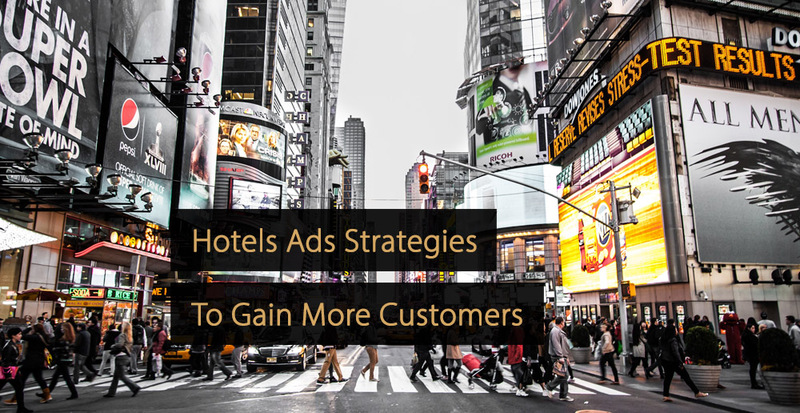 In this article, you’ll learn 10 effective strategies for your hotels ads. To maintain a good reputation in the modern world, you need to keep an eye on the way your hotel is being represented online. You have have the best hotel in the world but if people aren’t talking about it, you’re missing out. Obviously, you already make sure that your hotel is clean, well run and pleasant to stay in — but you can go one better by monitoring online reviews. As an example, your team could step in when someone is complaining and find out what you might need to improve. Engaging shows you care about your guests. Hotel ads on social media can be very valuable and are fairly inexpensive. By purchasing ads on social media platforms you can direct your message to the people who most need to hear it. One example is the ads that appear on Facebook, which are targeted based on a user’s interests and previous browsing habits. You’ll need to be fairly savvy about current social media trends and platform demographics — for example, teenagers using Tik Tok will probably be less interested in your high-end hotel than their parents on Facebook. When you’re thinking about social media, don’t forget email as a platform. User-generated content is a great way to build your profile. Encourage your guests to discuss your hotel by maintaining a social media presence they can interact with: a Facebook page they can like, an Instagram feed they can follow and so on. Better still, give your guests perks for interacting with your social media presence — for example, budget chains might offer a free breakfast for patrons who share photos of your hotel on Instagram. Offering perks for this kind of user generated content encourages users to give your hotel a boost and also improves customer experience. Automating your marketing is not just a good idea — it’s indispensable in today’s online world. Automation takes care of all those common marketing tasks, like reaching out to previous customers with the latest deals or reminders of the good time they had staying with you in the past. Did a guest spend their July holiday at your hotel last year? Automated marketing can send that person an email the following May, when they’re likely to be making holiday plans, to suggest they book with you again this year. Marketing automation improves engagement and gives your business a more responsive, human feel. Have you ever Googled for a local service and noticed the little “Sponsored” tag in front of some results? These businesses are using search engine advertising, paying a small sum to the search engine company to have their results appear when someone looks up a particular term. You’ll have heard all the buzz about the importance of keeping your business at the top of the search results; it’s no exaggeration to say that search placement can make or break a company. Search engine advertising lets you get the drop on other hotels by making sure that people searching for a hotel see your website straight away. Video advertising is a great way to let people see your hotel at its best. Watching a video can bring your hotel to life, making it much more attractive to potential visitors who want to know exactly where they’ll be staying. Two trends to watch are 360 video and VR (virtual reality). 360 videos are shot using omnidirectional cameras that record footage from every direction at once. Virtual reality hotel tours let people experience your hotel before they even set foot inside it, allowing them to walk around the facilities in VR. This kind of experience can make your hotel seem more up-to-date. Just because a tactic is old school doesn’t mean it can’t be effective. With today’s sophisticated data collection and analysis techniques, direct mail hotel ads can be targeted with great precision. For some demographics, especially older guests, direct mail can actually be more effective than newer methods such as social media marketing. If you combine direct mail with something the consumer wants, such as promotional deals and free gifts, you can reap a lot of benefits. A well-crafted direct mail campaign can garner new clients and build loyalty with your guests. Banner ads, text ads, in-app ads — all these are examples of display advertising. The aforementioned search engine ads can also be a type of display advertising. As people divide their browsing over an escalating number of devices, display advertising has only become more relevant. A potential guest may search possible hotels from a desktop, go to work and do a little more research on a smartphone and then make a final choice while browsing on a tablet. Display advertising lets you reach that guest whatever device they’re using, as your hotel ads follow them between different platforms and sites. Working with influencers on social media is a great way to boost your hotel’s profile, especially amongst Millennials and younger guests. Social media influencers are popular users (often minor celebrities) with a great many followers, who look to them for advice on fashion, future purchases and their lifestyle in general. Influencers often work with businesses, for example posting photographs of a hotel stay in exchange for payment or free gifts and other perks. This kind of promotion is increasingly popular and is very effective. Images of their favourite media darling splashing in your pool or dining in your restaurant can be very persuasive. Retargeting is a way to pull back potential guests who were on your site — maybe even partway through a booking — but have started to look elsewhere. One type of retargeting is website retargeting: this uses popups or reminders to encourage your visitors to stay on the page, perhaps by offering a discount or some other attractive deal. With social media retargeting, your ads follow the user to their social media accounts so they’ll be reminded to come back later. If you have the user’s email address, you can use email retargeting: dropping your potential guest a line to encourage them to finish their booking. Whatever marketing strategy you pursue, it’s important to monitor the effectiveness of your ads. Keep a close eye on your hotel ads to see which platforms and approaches are the most successful and build on that success to create an effective overall strategy.